CPSC Director General and APACC President Dr. Mohammad Naim Yaakub visited the Technical Education and Skills Development Authority (TESDA) on February 13, 2012. The visit provided opportunities for strengthening cooperation with TESDA, CPSC's focal agency in the Philippines and discussing various activities and plans of APACC and TESDA. Dr. Naim met Honorable Sec. 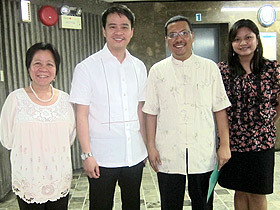 Joel Villanueva, Director General, TESDA (upper photo, 2nd from left) where he extended CPSC's full support to TESDA's objectives under the leadership of Secretary Villanueva. Dr. Naim also congratulated TESDA for recently receiving ISO 9001:2008 certification for its two programs namely Technical Vocational Education and Training Program Registration and Competency Assessment and Certification. In a separate meeting, Dr. Naim also met with Mrs. Mila Dawa-Hernandez, Deputy Director General for Sectoral TVET where they discussed APACC and accreditation activities in TESDA's Technology Training Institutes (TTIs). Various on-site visits by APACC are in the pipeline in assisting TESDA achieve its objective of increasing quality assurance among its TTIs nationwide. Recently, APACC conducted an on-site visit to the TESDA Women Center (TWC) as part of the re-accreditation process. 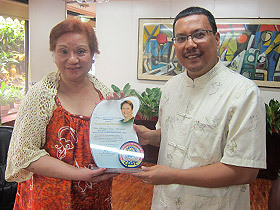 In especially extending CPSC's appreciation to Mrs. Dawa-Hernandez's long time cooperation with CPSC and APACC and recognition for having served as National Coordinator for Accreditation (NCA) of the Philippines, Dr. Naim presented her a plaque during the visit.